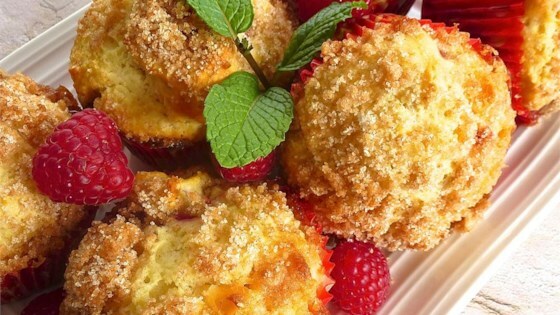 "White chocolate chips and fresh raspberries make for an irresistible muffin." Preheat oven to 400 degrees F (200 degrees C). Grease and flour 12 muffin cups. Combine 2 cups flour, 1/3 cup sugar, baking powder, and salt in a large bowl. Whisk both amounts of milk with egg in another bowl; stir into flour mixture with 1/4 cup melted butter, 1 teaspoon raspberry extract, and vanilla extract until just moistened. Batter will be lumpy. Fold in raspberries and white chocolate chips; spoon batter into prepared muffin cups. Mix 5 tablespoons sugar, 2 tablespoons flour, cinnamon, and 1/2 teaspoon raspberry extract in a bowl. Use a pastry cutter to chop 2 tablespoons butter into mixture until it resembles a coarse crumble; sprinkle over muffins. Bake in the preheated oven until a toothpick inserted into the center comes out clean, 18 to 21 minutes. Yummy! You gotta try these! Absolutely delicious! I used Pam baking spray on the non stick muffin cups and they came out of the molds perfect. Will make again. This is a keeper in my recipe box. Thanks for sharing. So delicious! I wish I had white chocolate chips, but only had semi-sweet. They were amazing. Definitely a keeper!